In today’s Times Square, it’s really more about the benches than the billboards. 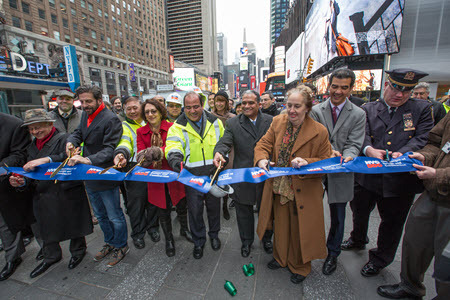 Opened just in time for the classic New Year’s Eve celebration, the New York City Department of Transportation’s Times Square Plaza overhaul has been by all accounts a tremendous success. Nearly eight years in the making, the project has turned Times Square from a car-clogged chaos into a pedestrian-friendly paradise. To consider what makes it work, pay special attention to the benches. The 11 benches placed strategically around the plaza tell you everything about the NYC Department of Design and Construction’s systems approach on the project. Before committing to anything, designers at DDC wanted to see how the Times Square space was used in daily life. The team started watching the structures in place at that time and how people interacted with them. 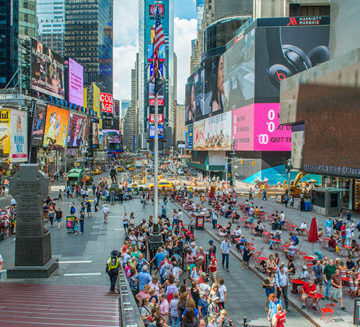 So with its anthropological research in hand, the team ensured that the new benches in the new Times Square Plaza are not merely standard flat surfaces; the granite slabs come in a variety of heights and slopes. There’s more to the new benches’ usefulness – they help direct traffic. Their placement is positioned to both ease the flow of New Yorkers in a hurry to get about their business and create open spaces where Times Square tourists can take in the scene at a slower pace. The locations also satisfy security demands. And the benches also contain utilities for electrical and data use when the plaza hosts events. “Those benches that look very nice to people actually serve multiple functions,” Peña-Mora said. It’s representative of the overall project, one that saw every decision take into account its practical effects on the community. Pedestrian barriers are one example. 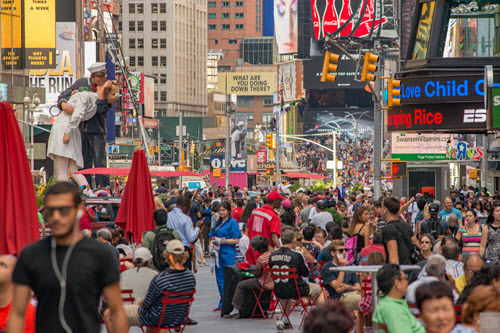 The department was worried about the negative effects of long-term construction on Times Square, from traditional commerce to tourism to the views afforded audiences on Good Morning America. So it engaged with artists to devise ways to disguise the construction work. One project had tourists look into cameras, and then photographs of their eyes were printed on large screens and used to cover pedestrian barriers. The overall project naturally had its challenges. Some of the subsurface infrastructure was more than 100 years old and required replacement. The project created an excitement of anticipation that attracted new private investment to the area, which in turn meant private construction – new hotel facades and the like – on top of the DDC work. 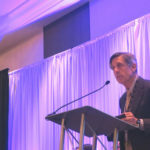 The entire project required coordination among a vast array of stakeholders, agencies, and groups. 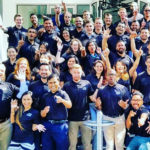 Peña-Mora led a group at a ribbon-cutting event for the project just in time for the nation’s eyes to focus on Times Square to ring in the new year. One month in, the Times Square Plaza has been so successful, it’s being hailed as a trendsetter for potential similar projects in the New York area. 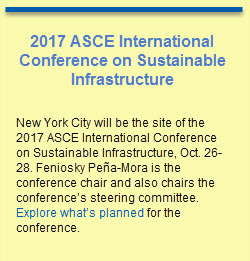 New York City will be the site of the 2017 ASCE International Conference on Sustainable Infrastructure, Oct. 26-28. 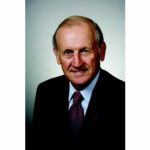 Feniosky Peña-Mora is the conference chair and also chairs the conference’s steering committee. 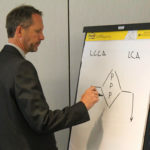 Explore what’s planned for the conference.